You know who the White Rabbit reminds us of? Your old pal Rob, who's always late. You've missed the beginnings of more movies and lost the tables of more reservations than you even wanna think about. You tell him, "Yo, be there at 7", and sure enough, he'll come strolling in at 7:30, like it's no big deal that you've been standing on the sidewalk in cold drizzle for the last half hour, waiting for him to show up so you could grab your tickets. And then, when you ask him what happened, he just shrugs and laughs and says something about how his phone alarm must not be working. What a jerk! In fact, you're starting to suspect that he's doing it on purpose. You know what that guy needs? A taste of his own medicine. That's why you should get this Gold Alice Clock Purse. This way, the next time he needs you to be someplace, you can be the one to just glide into the room a half hour - no, forty-FIVE! 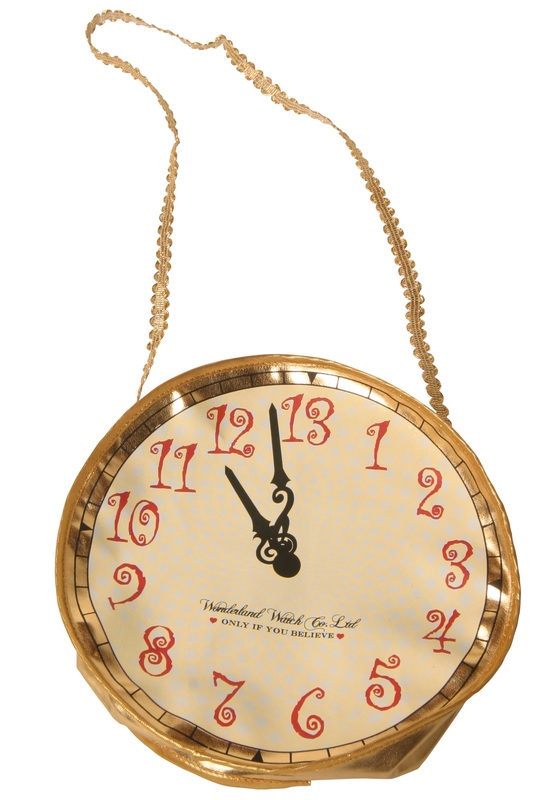 - minutes late...and when he asks you why you're late, you can just hold up this Gold Alice Clock Purse and shrug. It's non-functional! It doesn't even tell time! All it does is look like a clock! Hahaha, isn't that funny, ROB?